Lyndall Joseph Pomeroy was born in Yeovil in 1868, the son of mason Henry Pomeroy (1833-1904), originally from Beaminster, Dorset, and his Yeovil-born wife Louisa née Harrison (b 1834). 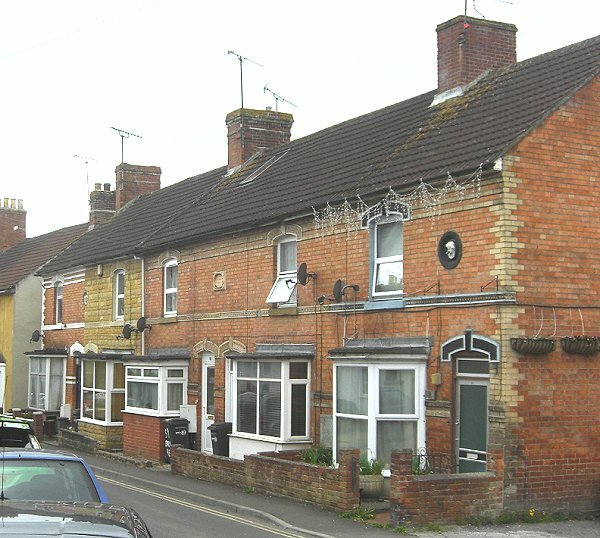 In the 1871 census Henry and Louisa were listed living in Huish with their two sons; Frederick (1856-1908), a mason like his father, and three-year old Lyndall. Both boys would become house builders. 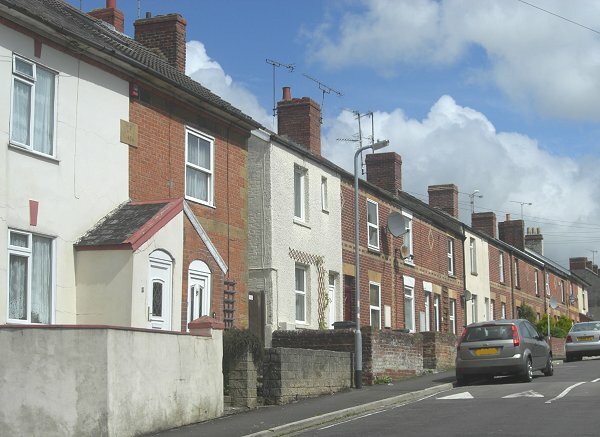 The family was still living in Huish in 1881 and Henry and Frederick both listed their occupations as bricklayers, while 13-year old Lyndall was working as a gardener. 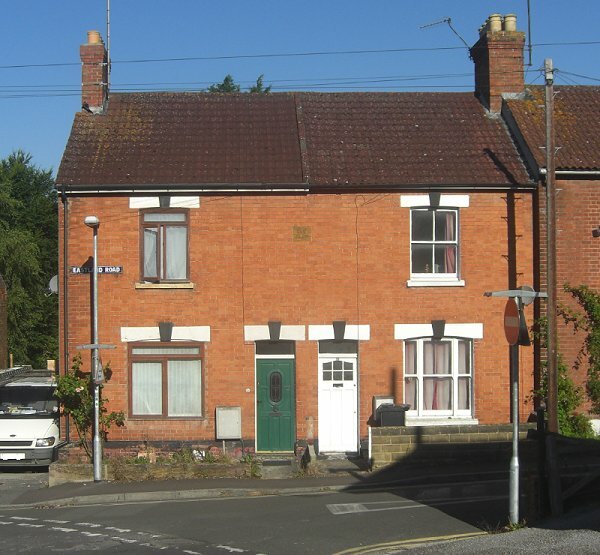 In the spring of 1888 Lyndall married Louisa Jane Phillips at Yeovil and in the 1891 census they were listed living at 9 (now re-numbered) Kiddles Lane (today's Eastland Road) with their one-year old son, Lyndall Henry James (1890-1921). Lyndall gave his occupation as a builder. 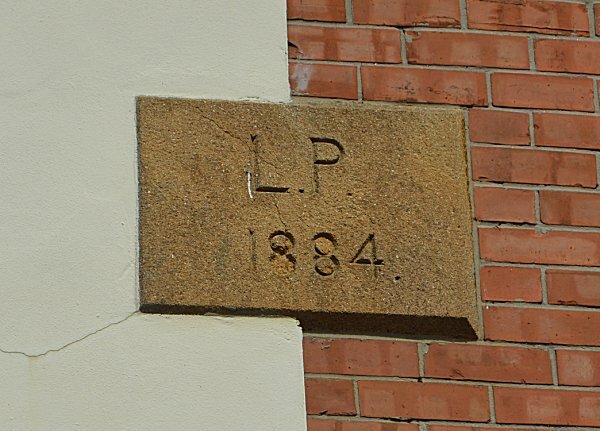 In the same census Lyndall's parents, Henry and Louise, together with his brother Frederick, were living in 1 Mount Pleasant Terrace, newly-built by Lyndall and bearing his datestone 'LP 1888'. Both Henry and Frederick described their occupations as 'Landlord of Houses'. Clearly being a builder had its rewards, indeed by the time of the 1901 census Lyndall, now aged 33, listed his occupation as 'Retired House Builder and Local Primitive Methodist Preacher'. Lyndall Pomeroy's known housing projects - part of Mount Pleasant Terrace (1884), Jubilee Terrace (1887), and Wayside Terrace (1889) - are photographed below. At the time of the 1901 census Lyndall and Louisa were living at 222 Sherborne Road with their children Lyndall Jnr and four-year old Constance. Lyndall's father, Henry, died in 1904 and his estate was valued at £2,031 (about £1,150,000 at today's value). By 1911 Lyndall had moved his family to Mudford where the census recorded him as a retired builder. By 1918 he was living in West Coker. In the spring of 1924 Louisa died and in the summer of 1928, at the age of 60, Lyndall married Lily Bertha Neville (1881-1963) at Yeovil. Lyndall Pomeroy died on 25 October 1938 at the age of 71. 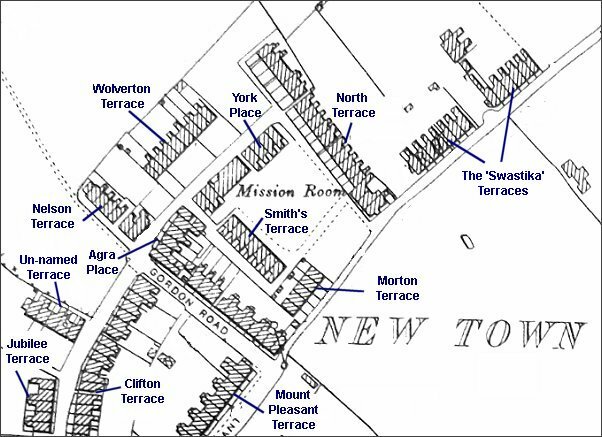 Map based on the 1901 Ordnance Survey showing the different speculative housing projects built in the early days of Newtown. Of those known to have been built by Lyndall Pomeroy, North Terrace is centre top, Jubilee Terrace is bottom left and Morton Terrace is at centre. 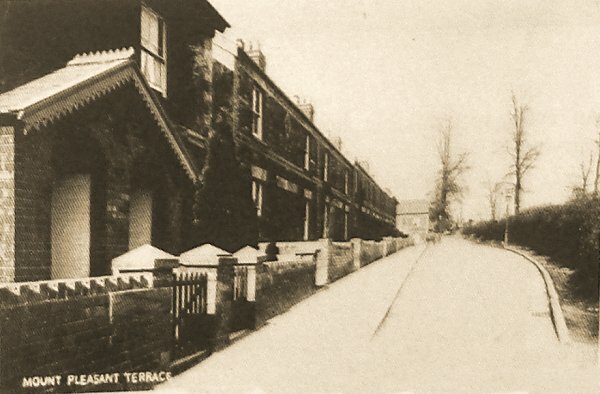 An early postcard of Mount Pleasant Terrace. The first two houses, at least, were built by Lyndall Pomeroy in 1884. The rope walk was the other side of the hedge at right. 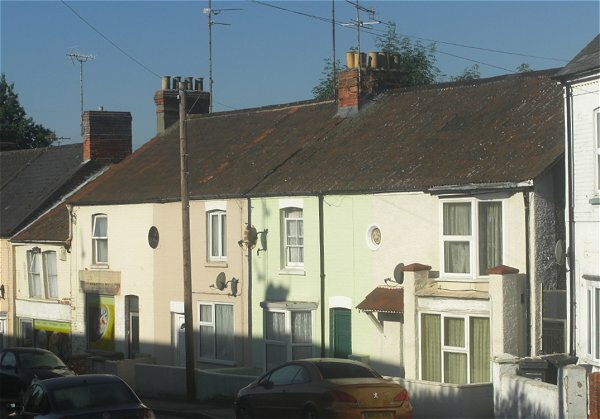 The two houses at left, with a datestone of 1884, were the first to be built in Mount Pleasant Terrace by Lyndall Pomeroy, followed within two years by the terrace of housing to the right called Mount Pleasant Terrace. All the houses faced the rope walk. The first house, at extreme left, was home to Lyndall's parents. Photographed in 2014. Jubilee Terrace, built by Lyndall Pomeroy in 1887 and named to commemorate the Golden Jubilee of Queen Victoria. Photographed in 2013. 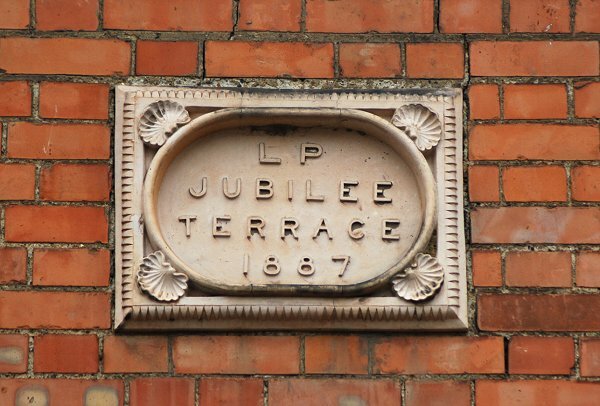 Lyndall Pomeroy's 1887 terracotta datestone for Jubilee Terrace, commemorating the Golden Jubilee of Queen Victoria. Wayside Terrace - built by Lyndall Pomeroy in 1889 and photographed by me in 2014. 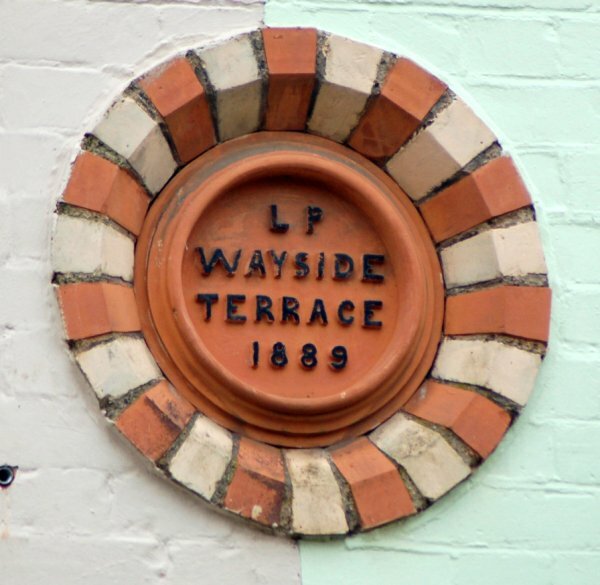 Lyndall Pomeroy's 1889 terracotta datestone for Wayside Terrace. The pair of houses in Eastland Road built by Lyndall's brother Frederick in 1889. 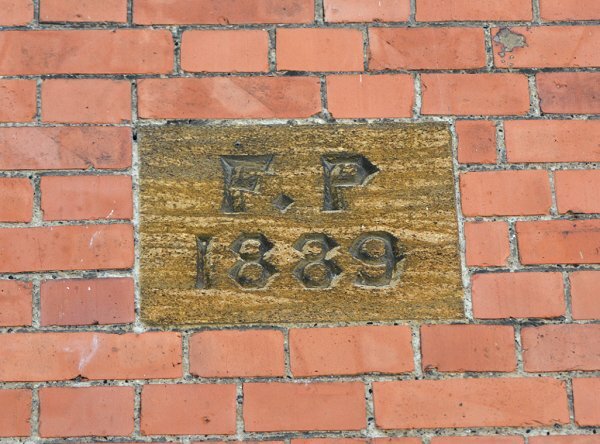 Frederick Pomeroy's datestone on the above pair of houses.